In keeping with longstanding tradition, President Barack Obama and First Lady Michelle Obama greeted President-elect Donald Trump and his wife, Melania Trump, at the White House early this morning before Donald was sworn in as the 45th president of the United States. Watch the interaction (and the first lady’s reaction) in the video above. 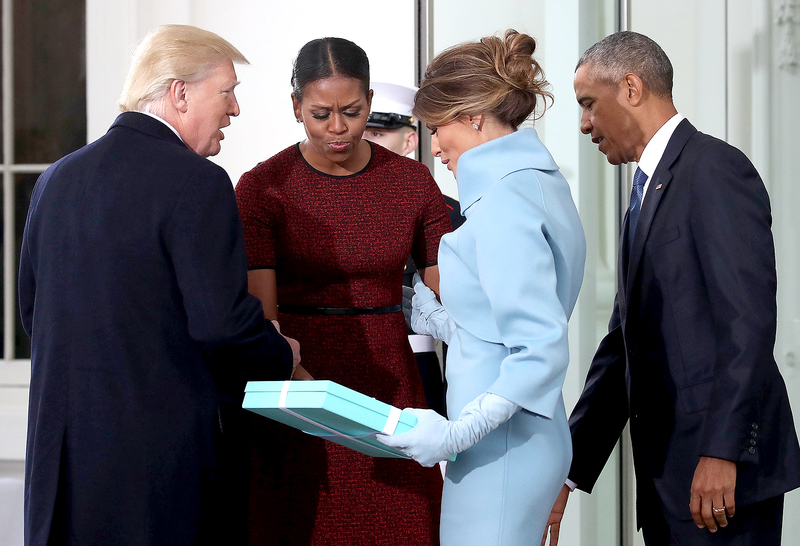 While exiting her limo, a Ralph Lauren–clad Melania clutched a medium-size Tiffany & Co. box, which she presented to a rather flustered Michelle. 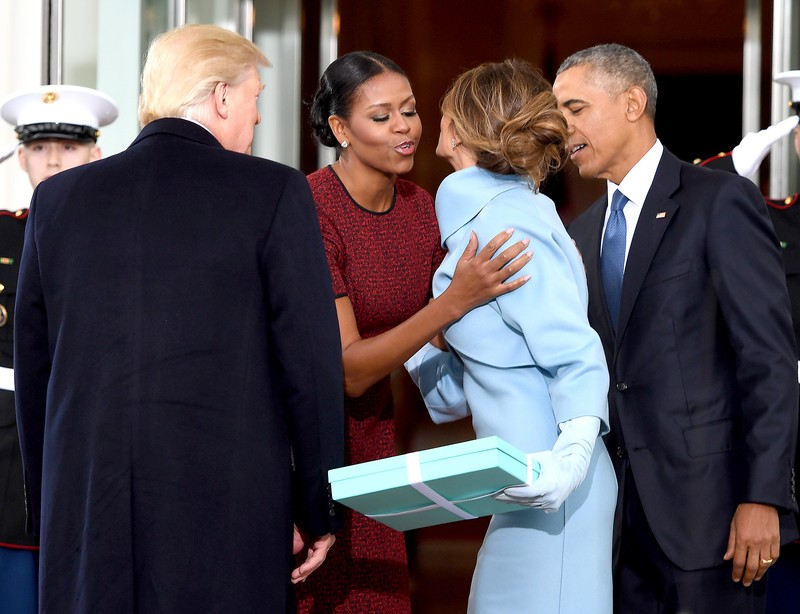 With the robin’s-egg-blue present in hand, the outgoing FLOTUS awkwardly looked around for someone — anyone! — to hand the gift off to so the couples could take an official photograph together. A present from Tiffany’s is a fitting choice from Mrs. Trump. Not only is the Fifth Avenue store located next to NYC’s Trump Tower, but Donald’s fourth child (with second wife Marla Maples), Tiffany, is reportedly named after the luxury jewelry shop. The gift shouldn’t be a surprise to Michelle either. In January 2009, when her husband was sworn into the presidency, Michelle, now 53, presented former First Lady Laura Bush with a leather journal and engraved silver pen. Unlike her predecessors, Melania, 46, will not live at the White House with her husband of nearly 12 years. Instead, she’ll remain in NYC with their 10-year-old son, Barron, allowing him to finish out the school year.